L’Azalée Cruises proudly offers Halong Bay’s newest premier cruise experience on vessels which operate to certified marine standards and come fully appointed with modern safety features and equipment together with kind and well-trained staff. Moreover, our cruises were crafted in pursuit of combining heritage and culture with international resort standards. Those who choose L’Azalée Cruises on their visit to Halong Bay will not only enjoy the majestic scenery, but will also experience Vietnamese culture while on board through cuisine and special activities such as visiting a floating fishing village and a pearl farming village on unique cruise routes. An azalea flower needs temperate, fresh conditions to flourish, and we are delighted to host our guests in a similar atmosphere, mixing feminine, sweet, fresh and delicate touches. 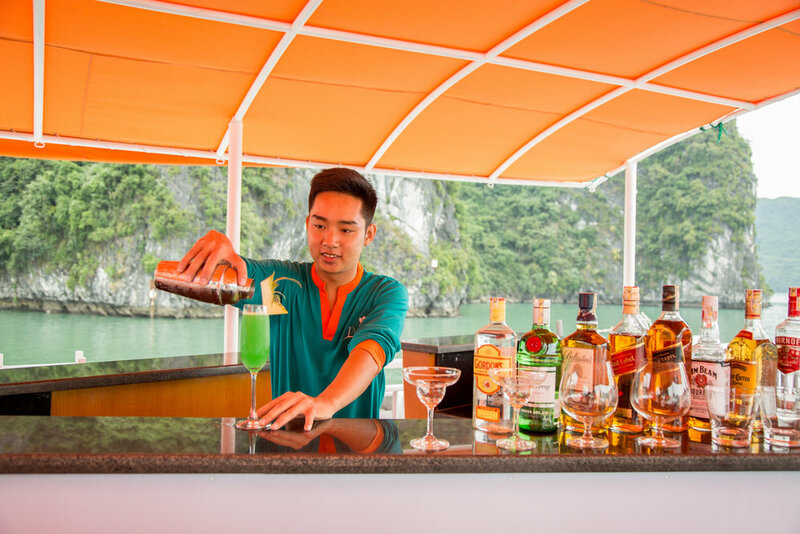 Our fleet is innovatively designed and decorated in bright turquoise and orange hues, making L’Azalée not only a highlight of Halong Bay, but also creating a fresh and active presence for guests on board. With carefully trained English-speaking staff and a warm attitude, we aspire to leave all cruise passengers fully satisfied upon arrival, with welcome drinks served on board. We proudly provide international-standard accommodation and facilities on all cruises, including a sundeck, restaurant, bar and marina-based lounge exclusively reserved for L’Azalée cruise guests. These facilities create comfortable and convenient excursions while serving unique and appetizing cuisine as well.